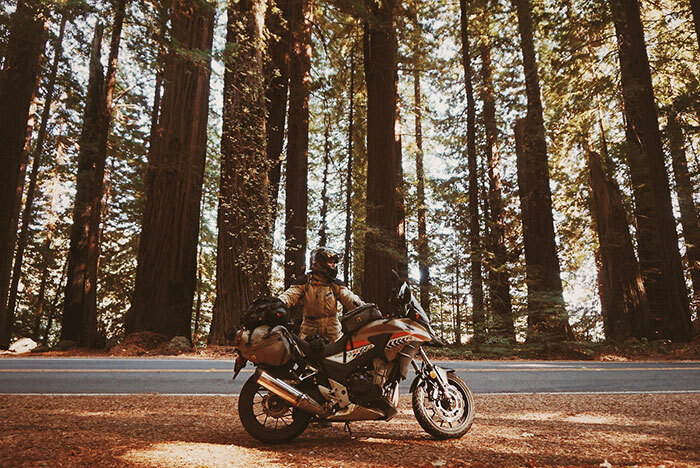 Next Adventure Ambassador Amanda Zito is an avid motorcycle adventurer. 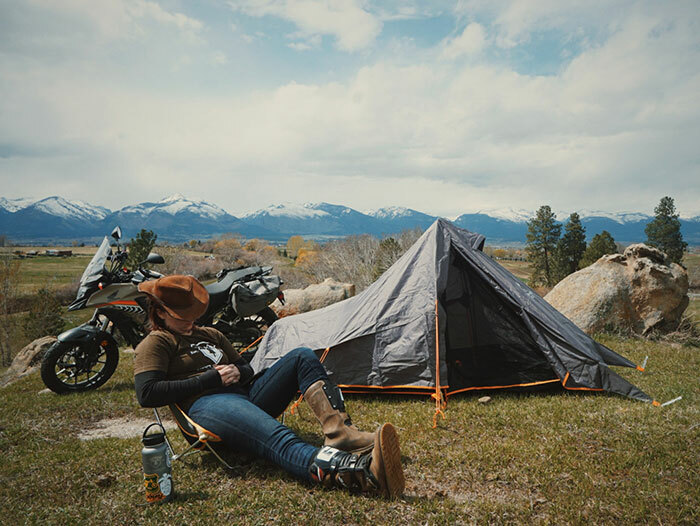 She breaks down the planning for your next moto trip into seven easy to manage sections and provides a list of resources to get you started. Depending on the kind of person you are, planning a trip can be very exciting, or very nerve-wracking. I’m here to hopefully ease some of the pressure and break it down into manageable sections for those who feel overwhelmed just thinking about planning. It’s a lot of information but just take it one step at a time. I’m in the category of strange people who love making list, doing research and planning future adventures. Before The Pilgrimage -a solo trip I did in 2016, where I lived on the road for 2 ½ months- I started planning almost a year ahead, purely because I enjoyed the planning so much, and because it gave me the distraction I needed to get through my last year at a pretty awful working environment. In reality, you absolutely do not need a whole year to plan your next adventure. Depending on the length and your amount of free time, you can plan a trip in a week, a month, or -in the case of going out of the country- 3-6 months. So let’s start with the simplest question. 1. How much time do you have to work with? 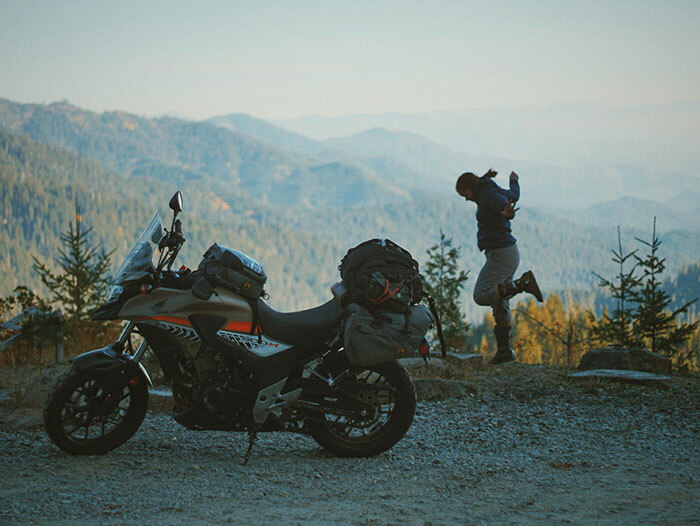 Unlike other trips, where you can fly anywhere you like in a short amount of time then spend the majority of your time at your destination, a motorcycle trip is defined by riding the miles to your destinations. Some would argue that the riding is the trip. Time is forever the downfall of new motorcycle travelers. It’s so easy to want to do really huge miles and visit a lot of places but forget about things like eating, staying hydrated and just having time to rest. For example as a rule, if I want to enjoy myself and do some sightseeing I limit myself to Miles Per Day. Alternatively, if I know that I have to make miles, but I don’t want to be totally exhausted when I reach my destination I limit myself to 320-400 miles per day. This leaves just enough time for breaks, but not really enough time to stop and enjoy the scenery or touristy stops. I learned these numbers over the course of a couple trips and learning when I need to stop and the speed at which I can comfortably. Let me emphasize that everyone is different. Everyone has different riding styles, comfort levels, or how long they can ride between breaks. Learn and know your comfort zone and don’t push it. Give yourself plenty of breaks. If you’re new to riding long distance and you don’t know your comfort zone yet, do not expect yourself to go more than 120 - 200 miles in one day. You want to enjoy your trip, not feel like you’re racing through it. On the other end of the spectrum, for those with more control over their time off and already know how far they need to go. This kind of equation is great if you have a target destination like a Rally Event, or visiting someone in another city. A good time to roll into camp or to check into your hotel is between 6-7pm (earlier in the Winter). Give yourself time to eat (generally an hour for each meal), minimum 30 min breaks after every 2 hours of riding or 15 min breaks after every hour riding. This being said, do yourself a favor and don’t expect to stick to a regimented schedule, unless you’re riding with a large group. 2. Where do you want to go? What route should you take? With your range in mind, now it’s time to do a little research about what’s around you. This is the fun part. Start a List. Let yourself go kind of nuts, think about places that you’ve driven by and wanted to visit, or places you’ve said you wanted to go to while talking to friends. Recreation.Gov: You can explore their trip ideas, or use their find places & activities search your city or a state you want to go to to find recreation areas or build a trip using the filters to show you campgrounds, tours, hikes, and recreation areas. Instagram - Search Places: type in a Town or State, and sift through the pictures, you may find something you really want to visit. 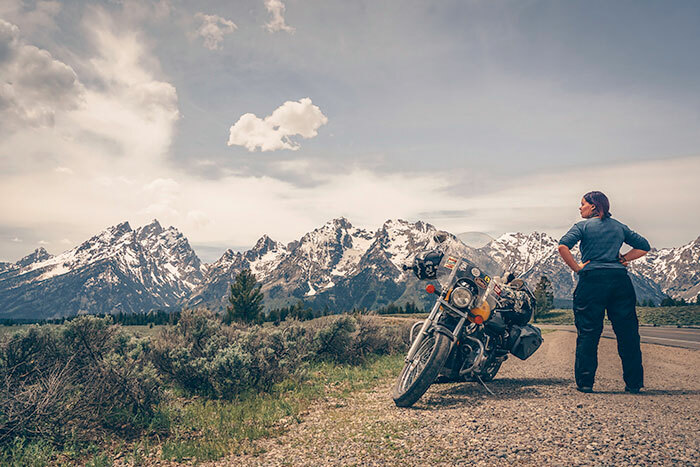 Once you have an idea of the destinations/attractions you want to visit, my personal favorite way to find my route isn’t Google, but Rever and physical Butler Motorcycle Maps. The special thing about Rever is that if you upgrade to Pro you can see all of the highlighted Butler routes (aka the best motorcycle routes), while you plan your route. This is the harder part. Set goals, not an Itinerary. Limit yourself to trying to hit 2-3 highlights per day. Slowly cross off things on your list until you narrow it down to the handful of things that you absolutely want to see. Assume that it will take twice as long as Google Maps says it will. Know your comfort zone and don’t push it. Think about the big six. Give yourself a daily stipend and stick to it. Gas - Without gas money, you’re not going anywhere. Now that you have an idea where you’re going do a little look-see at what gas prices are like in the places you want to go. Gas Buddy.com is a good resource for general gas prices in the US, yes even Premium. Once you have a pretty general idea of the gas price, pick the highest price, then plug in your bike’s MPG and miles of your trip into the Fuel Cost Calculator on Calculator.net to get a rough idea of your budget for Gas. 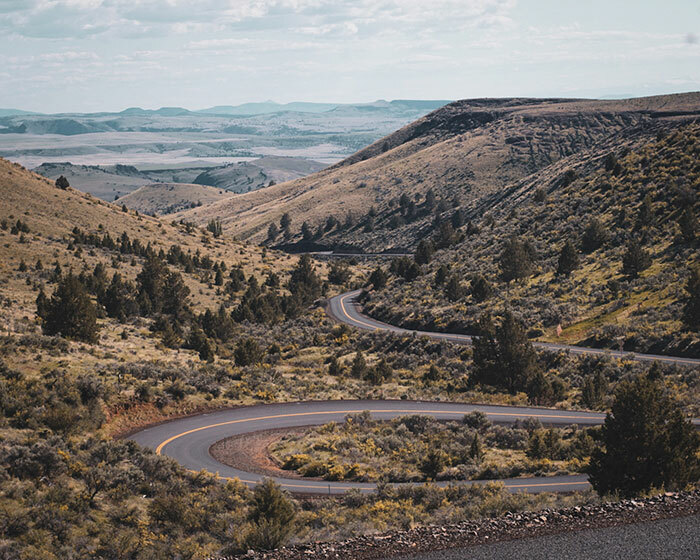 It’s better to round up, just in case a road is closed and you have to take a detour that was twice the mileage of your planned route. Food - Are you cooking for most of your meals or eating out? Your body doesn’t care if you’re on a trip — it needs its nutrition! If you bring a camp stove, shop at grocery stores along the way and make your own food you can eat pretty good on anywhere from $10-40 a day. Even if you plan on cooking most of your food, leave yourself a little room to eat out at least once a week. If you’re going to eat out, what kind of places are you going to be eating at? Are they local dives or tourist hot spots? This will make the difference between $55 a day and $115 a day. Lodging - Are you going to hotel it or camp? Even if you plan to stealth camp the whole trip, you should still budget for around $20-40 a day for camping. It’s better to have extra money than to run out. If you’re hotelling it, plan accordingly. Do your research. Some places, $70 a night is reasonable, other places you won’t find anything for under $120. Think about options like Air B&B, and staying with friends to save a little bit of money in touristy areas. Do not make reservations (hotel or otherwise) passed the first 1-2 days. The plan will always change. This is part of being flexible, in the case that you break down, there’s a road closure, or you meet some really cool people, you don’t have to go through the trouble to canceling or changing reservations. Fun Money - Kind of self-explanatory, this is your money for museums, shows, shopping, tours. My hint for you here is to do yourself a favor if you’re traveling in the US, get yourself a National Parks Pass! After you visit like two parks it pays for itself. Paperwork (aka logistics) - This step will require a little bit of research to account for. Horizons Unlimited is your friend for planning if you’re going out of the country. Emergency - Make sure you have a good cash emergency fund and a credit card just for emergencies. This isn’t just in case of a medical emergency, but also if your bike breaks down and you have to take it to a shop. Or if it rains, all of your gear gets soaked and you have to make an unexpected hotel stop. The longer your trip is the larger your emergency fund should be. Now it’s time to get down to nitty gritty and research your route. If you’ve decided to hotel it, do a little bit of research beforehand but don’t go overboard. Just enough that you know what the general cost of the hotels are in the areas that you want to visit so you can budget accordingly. You don’t want to get stuck in a tourist town with a hotel cost over $200 if there’s just as nice of a room a town over for $80. If you’re camping, star a couple backups all along your route on google maps. Some campgrounds have showers, some don’t, sometimes you’re better off dispersed camping in a National Forest which is often times the best option. Another option is to look up campsites on Free Campsites.Net, this isn’t always the most reliable option but it’s a good place to start. Is there some kind of cool tour, attraction or event where you want to go? Find out when it happens, when it will be closed and how much it is, make sure you can fit it into your budget. Find out if your bank has fees if you’re going out of the country and let them know when you’re traveling. Let them know if you’re traveling even if you’re staying within the US to help prevent your card getting shut off when you buy gas 200 miles from your normal stomping grounds. They have an amazingly in-depth resource for Planning a Trip, including information about Carnet de Passage, and a nice outline of other paperwork you need to be thinking about. In general, it is one of the most valuable resources for International Motorcycle Travel which is kept up to date by hundreds of travelers. Find out what the country you’re visiting requires as far as visas, motorcycle insurance, health insurance, do you need a Carnet or a temporary import or neither, and what you can and can not bring into their country. For example, Mexico requires you to purchase Mexican Auto Insurance, they do not accept US Auto Insurance if you get pulled over. In general, I highly recommend googling “ Visit (Country)” and refer to the official government website. Most government websites will make it fairly easy for you to find out if you need a visa, and a couple other searches will tell you if you need anything special for your motorcycle. As a part of this phase; make copies of all important documents, stow them on a different part of the bike than the originals. Scan all important documents and email them to yourself or download them to your phone. Reduncies are what will save you in case of emergencies. 5. What if the bike breaks down? One of the first questions people ask when they’re almost ready to take the leap and go out for the first time. What happens if the bike breaks down? How do you prepare for that? This is a very legitimate fear. Especially on a motorcycle. First, take some preliminary precautions. Take some steps before you leave to get comfortable with your bike. Do basic service on your bike before you leave. 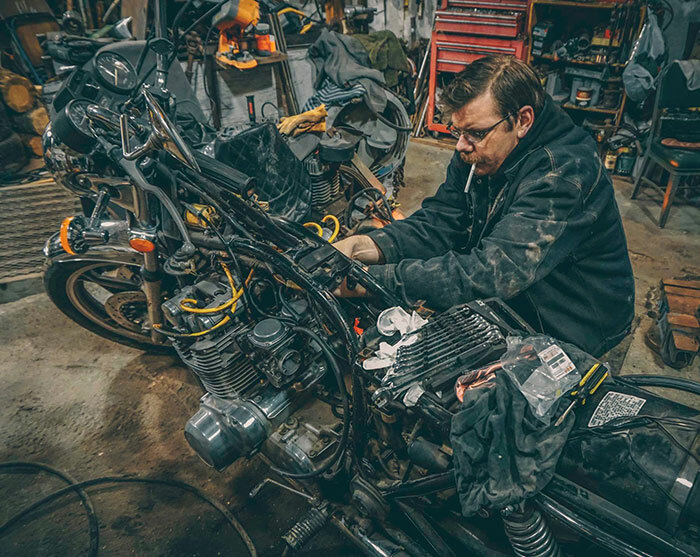 Change your oil, clean and tension your chain, check the air filter and your spark plugs. Lay out all of your tools while you’re doing this and keep track of everything you use and everything you don’t. Only take the tools specific to your bike (ie everything you used while servicing the bike. Including Chain Lube, and some way to clean your chain.) On top of the things you used for your service you should always be carrying zip ties, duct tape, a tire pressure gauge, JB weld, a tire patch kit, spare fuses, master link, and needle nose pliers. Even if you don’t know how to use everything, someone else will. I personally always pack the whole Haynes or Chilton manual for my bikes, if I know I’m going for more than 4-5 days or more than 500 miles (a day’s drive) from home. An alternative that some people do is to take photos of specific pages of the manual, like specifications and particular instructions. If you have absolutely no interest in ‘getting your hands dirty’ that’s ok, but make sure you make a solid plan to be able to contact people even if you don’t have service. Get yourself some roadside assistance even if you think you won’t use it. Certain insurance companies allow you to add it on to your current plan. There’s also AAA or AMA. Another option is to join BMW MOA ( you don’t have to be a BMW owner to join, and they have a large resource of bikers who help other bikers). Alright, say that you’re on the road and the worst happens and the bike breaks down. If it won’t start DO NOT sit there pushing on the starter button until the battery dies and you add to your problems. (ps on some bikes this could also ruin your starter.) Take a minute and breathe, give the bike some time to rest. Take in the situation and start your systematic checks starting with 1) is the engine cut switch off? 2) Is there gas? 3) Is the kickstand down? 4) Do you need to hold the clutch in? All experienced travelers know this list, but everyone forgets simple things when they’re worked up or in a hurry. Often times, it’s the simplest solution. Remember that all bikes (unless they’re electric haha!) need Gas, Air, and Spark. Start with the simplest things you can get at, then work your way down the troubleshooting list (this would be a good time to have your Chilton/Haynes manual with you! This is not a packing list by any means, I do have a list of the things that I personally take on my website here, but the purpose of this article is to line out the things you should be thinking about when planning your trip. But just to cover some bases on the ‘what ifs’ list here are some recommendations. - If you have space, you will fill it. Try to pack your smallest bags. Pack Light and remember that you can almost always purchase anything you need while you’re on the road. - Always, Always, ALWAYS, bring waterproof gear and an extra pair of gloves. The weather will always change even if you think it’s going to be dry as a bone that’s the one time you will be caught in the storm with wet Plan for all types of weather, cold, hot or wet. - Speaking of emergencies customize your First Aid Kit, make sure you have something to deal with burns, bug bites, tweezers to remove bee stingers, electrolyte tablets, and Ibuprofen. I’m not certified, but these are just a few things that in my experience are must-carry in my First Aid. - Net Bungees are your best contingency plan for unplanned purchases, or taking your groceries back to camp, or letting your laundry wind. 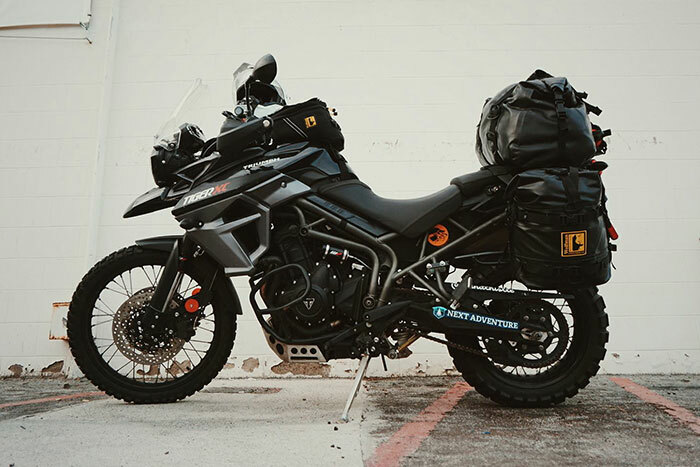 - Stoable/Packable Backpacks (or alternatively having a convertible tank bag with backpack straps) will save you from carrying your tank bag around when you want to spend a day away from the bike. - Pack synthetic clothes. Cotton is your enemy. Pack clothes made of synthetic materials (ie polyester, nylon, spandex), they will wash easy and dry Merino Wool is also a great option to keep yourself warm and dry. Synthetics and Merino Wool are generally anti-microbial, and moisture wicking, which will keep you from stinking (as much), and keep you comfortable. - Choose any travel companions very carefully. - Let someone you trust know where you’re going before you leave, and make a plan for check-ins so they know you’re going before you leave, and make a plan for check-ins so they know you’re alright. - Crampbusters can save your wrists on a long stretch of straight highway. - Test all of your gear before you leave. 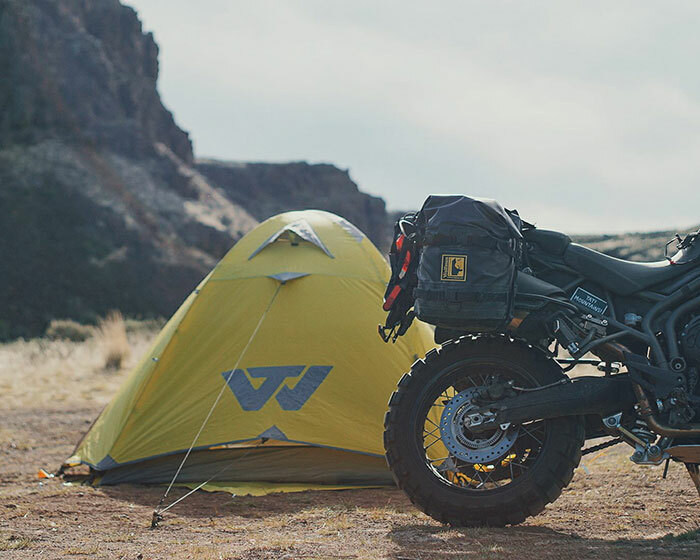 I mean it, set up your tent, your sleeping bag, your air mattress, wear all of your gear on the bike, turn your headlamp on for more than 3 min. Test Everything. - Tape Emergency information, including emergency contacts, onto your helmet or the back of your phone. - You can get ‘Do Not Remove My Helmet’ Stickers to place on your helmet so that civilians do not try to take your helmet off in case of a crash before the ambulance arrives. - Windscreens will reduce your fatigue on long highway stretches. - You can do laundry on the road, synthetic clothes wash very well in a sink. - Handlebar mounts for your phone are fantastic for directions and/or GPS. You will never have everything planned and ready. Set a date and stick to it. The rest will sort itself out. Things change. Remember that weather, road closures, sickness, and unplanned mechanical breaks can seem like a real bummer at the time but they can often put you on the path to an amazing place that you wouldn’t have found. Remind yourself that this is better than work, even during the bad times. - Figure out how much time you have for your trip. - Decide where you want to go, and how you want to get there. - Be realistic about your mileage,and figure out where you CAN go. - Add up your budget for gas, food, lodging, fun money, paperwork, and emergencies. Round UP. - Research, research, research. Gas stops, mechanic shops, general research about places to camp and what the hotel costs are. (This is also the secret “Finalize your Budget” step as you learn more about costs.) What paperwork you’ll need etc. - >Pack light, and only the things you absolutely need. - Stay flexible, realize your trip will not go 100% to plan, and accept that things will change.